Inserted are a couple of recent photos of Orla, showing off her new look, minus the nasogastric tube that is! We no longer receive funny looks when we are out and about. It was 12 months ago today that Orla was admitted to the Bone Marrow Transplant Unit. The day resembles some similarities as I’m packing…. However this time, packing for the flight and a few days away on the north west coast of Tasmania that we postponed last year due to Orla’s surgery before her transplant and I’m very much looking forward to it. Life is really starting to take on a sense of normality which is a great feeling and in stark contrast to the anxiety of this evening 12 months ago. We did not know what lay ahead for Orla. I did not know if I would ever bring her home as I drove her to the hospital that afternoon. In an attempt to describe the feelings of that day, the anticipation of jumping off a cliff is in my mind, not knowing where you are going to land, so many ways it could go and we fortunately feel like we are starting to make our way to safe ground. Day + 336 No drugs and No tube! 2014 has begun well for Orla. Firstly, we saw the BMT doctor a couple of days after our return from Tasmania and received some good news. Orla’s most recent blood test show her immune system has reached a level where she can now stop the antibiotic she was having twice a week to to assist it if she were to come into contact with any nasty bugs. This was the one remaining drug and hence Orla is now drug free which is obviously very pleasing. Orla’s immune system is not completely 100% normal, we are told this will take over 12months, but she is well equipped to put up a good fight against any viruses or bugs she comes into contact with and importantly too, her immune system would now be able to remember them. The reality of this means we no longer have to isolate Orla and are readjusting back into life as we knew it until 12 months ago. We are however a little more careful than previously, a side effect of dealing with so much sickness, we would like to avoid it for a little while at least! Orla’s immune system status also means she can have more immunisations and she had the first of a multi vaccine injection a few weeks ago which now means she is immunised as well as the average 2 month year old Aussie kid! Secondly, Orla accidentally pulled her nasogastric tube out last Thursday. This never happens at an ideal time, especially so when it was 40 plus degrees celsius and the tube is only for fluids !! I’m not sure if it was the fact we felt the time was right, we really needed to dedicate the time to getting Orla to drink, or the strong desire to avoid Orla experiencing and us witnessing another nasogastric tube insertion that drove us not to return to the RCH that day and “see how we go”. It will be one week tomorrow and she remains tube free, looks rather different and we think feels rather good without it! She is managing to drink from a cup which has piece cut out to assist the person assisting her control the rate the fluid flows into her mouth. We are also needing to thicken the fluid that she drinks and coming up with a variety of creative ways of including as much fluid in her food as we can to avoid her becoming dehydrated…I never knew a weetbix could hold so much milk!! She is doing well and getting quicker but it is slow and tedious but, I must say, less stressful than the constant concern of the nasogastric tube being inadvertently pulled out. And Orla’s obsession with putting her hands in her mouth, meant the dressing was more often than not wet and would thus lose its adhesiveness and constantly had to be redressed and reinforced. We are also hoping after 11 months of no drinking, Orla may possibly start to remember thirst which would of course be the biggest motivator of all for her to drink more. Finally, today marks quite a milestone in Orla’s BMT journey. It was this day 12 months ago that she underwent her surgery in preparation for the BMT. This included her Hickman line insertion, which got infected and dislodged and had to be removed and another inserted, an ovary removed, we will not know for many years if the chemotherapy she endured has made her infertile, and her second set of grommets inserted which are fortunately still in place. I remember the BMT consultant and registrar gave Ed and I are a tour of the BMT unit while Orla was having her surgery, it was just the beginning!! Day +314 Happy New Year! A quick hello from Orla’s blog to wish you all a safe, happy and prosperous new Year for 2014. We are definitely entering this year with some positivity that has replaced the nervousness we felt entering 2013. This is mixed with much relief in many ways that the last 12 months is behind us and that we made it! We are currently in Tasmania, specifically Freycinet Peninsula on the East Coast. The weather is being kind to us, Orla enjoying a paddle in the sea this afternoon and wasn’t put off by the cool (ish) water temperature. 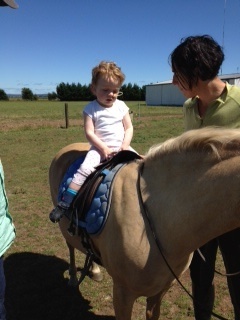 She has also thoroughly enjoyed the change in scenery, the Spirit of Tasmania (sea ferry), playing with her crazy cousins and the general extra socialisation around this time of year as well as her first ride on a pony (thanks Jo). Seasons of Love – 365! The number accompanying the post today is not related to the number of days since Orla’s bone marrow transplant but instead those since her diagnosis. It was on this day last year, Ed and I learnt that the number of symptoms Orla had displayed since her birth to 16 months were all indicative of the very rare disorder, Alpha Mannosidosis. We were devastated as were our families and many friends. I remember feeling consciously aware that the sun was able to rise the next day. We were absorbed in grief, it defined us for a few days, we then had to act swiftly and were sent on the path of planning and preparing for the BMT marathon. Ed and I no longer feel devastated, sad at times along with questioning “why us” and some anger but we are learning to accept life for what it is and appreciate many things as parents that I’m sure we may not have otherwise. I had plans to sit and write a poem over the past few days to capture some thoughts and emotions of the past year but Orla has had a fever and thus I’ve been trying to catch up on lost sleep and visiting the emergency department at RCH. So we ended the year where it began although 12 months ago we needed to ask where to go!! Orla is getting over what is more than likely a virus and we were relieved the doctors sent her home yesterday without taking bloods or giving antibiotics…a sign things are actually becoming more “normal”. In my thoughts today…the word CHANCE occupies some head space, reflecting on how I would have described it previously, I view it rather differently now or rather not as flippantly. The other thought has found me thinking about a song in the rock musical, Rent which I saw a number of years ago. The song is titled Seasons of love and it refers to the concept of measuring a year in life and how to do so. It’s late at night here in Melbourne now so I’m ability to put expressive thoughts to paper is diminishing…..But, I would measure this past year in my life as my most challenging yet. I also feel a strong sense that it may become that which I measure as my most rewarding. It is definitely as the song describes, a year measured in love. Finally, Please see a photo below of the gorgeous girl this blog is dedicated to taken earlier in the week….Lovely! There are some benefits to isolation such as visits from talented people like Anna in the photos below with Orla. 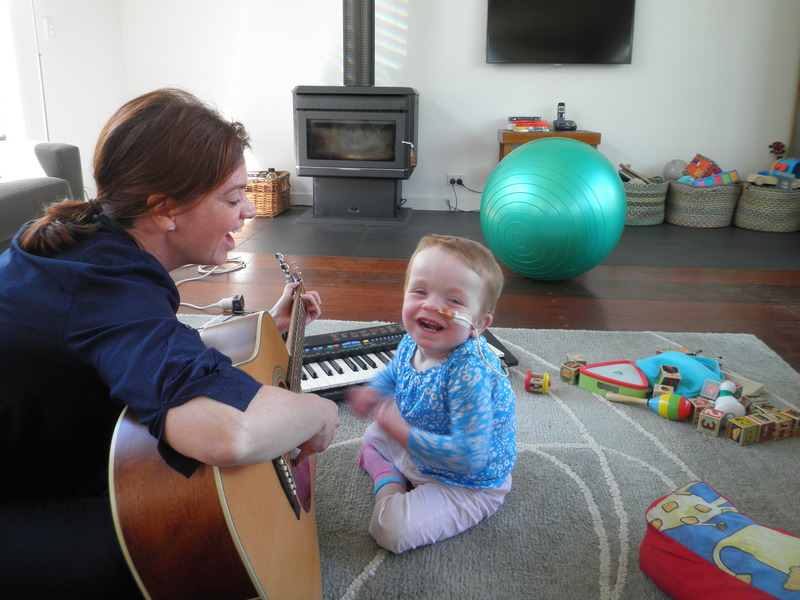 Anna is a music therapist with the organisation, Challenge. These photos were taken a little while ago, Orla’s hair is now a little longer and curlier! Orla is continuing to do well. From a BMT perspective she is tracking as hoped and everyone at the children’s cancer centre comments on how well she looks whenever we attend! She had some blood tests a few weeks ago to check the status of her immune system which is continuing to develop well. Orla’s new immune system is not quite fully functional as the numbers of some types of cells are still a little low. However in the coming week she will finish weaning the immune suppressing medication, Cyclosporin (a day worth celebrating) hopefully then her immune system will continue to develop. Orla will then be able to stop the only other remaining medication, an antibiotic she has twice a week to guard of any bugs she may have come into contact with. She did develop a cold a few weeks ago which didn’t render her unwell at all really but the issue was yet again her ears…in particular her hearing….fluid on top of her existing hearing impairment means she becomes more significantly impaired and a routine hearing test last week confirmed this in one of the sound frequencies. It is thus really important for her speech and language development we keep her as well as possible. Orla’s eating or appetite seems to have exploded in the past week. This may be coincidental but we stopped her anti-fungal medication (based on the results of her recent blood test) this week and things seem to have improved significantly. Nonetheless we are delighted, this is a massive achievement and we hope drinking might be next!! Orla is thus in turn sleeping much better although last night was quite an exception with her waking at 2:30am and no chance of returning to sleep! It is Melbourne Cup here tomorrow so we are taking full advantage with a few extra days off and are away for a long weekend as a family for the first time in a very long time and enjoying the change of scenery. We can’t help but remember and reflect on how different we were feeling at the same time last year when our anxiety and stress levels were starting to heighten as we were getting closer to Orla’s diagnosis having been to the geneticist this same week. Day +218 – Running a marathon….. While many Melbournians including a few friends, are in full training for the impending Melbourne Marathon, we feel like we are running one of our own. At one of Orla’s recent visits to the hospital when feeling somewhat exhausted, I exclaimed to the BMT consultant “this is like running a marathon” and she responded wholeheartedly, “that’s precisely what it is…”!! This particular marathon has no set course or training schedule and hence there have been a number of moments of late when I have felt I have developed an understanding of the term, “hitting the wall”. The last time I posted was on Orla’s birthday. She had been to the hospital that day for an IV antibiotic as she had developed a temperature the day before. While she was there, she was spoilt with a birthday present from the staff and her nose was also swabbed. We received a call from the BMT fellow the next day to let us know the swab was positive for Influenza A virus -not ideal when recovering from a BMT! Ed must have had it and Orla had caught it from him….unlucky for both of them. Thankfully, Orla coped remarkably well (better than Ed!) however she needed to be watched quite closely and hence we visited the hospital regularly for the next couple of weeks. This was one of the moments which I would describe to felt like I was running a marathon, two-thirds through and faced with a hill to climb. Orla needed to continue on an oral antibiotic for an additional week following her initial IV doses. Throw this into the mix of a gut which was still recovering and Orla’s bowels reverted back to what they were like in hospital. The constant diarrhoea had her uncomfortable, sleeping more poorly than usual and the skin on her bottom starting to break down again. As I said, Orla needed to be watched closely and we did have a few days of concern as her blood counts didn’t recover during this time as quickly as her BMT consultant would have hoped or expected. Because of this concern, she needed to have some extra blood taken on one particular day to check her chimerism. That is to make sure her blood cells were still that of the donor. Rationally we knew everything had been tracking well until this point although the consultant was concerned enough for the extra tests to be required, hence we were slightly worried. Fortunately, Orla’s counts recovered before the chimerism result was received so we all breathed a sigh of relief including the consultant! The “hitting the wall” feeling is due to a combination of factors. Caring for a child undergoing a bone marrow transplant, as this blog details, is huge and the stress of keeping them free from infection is also socially very isolating. Plus, Orla is still not eating more than small tastes really. The nasogastric feeds are relentless and the time it takes to try to feed a child who isn’t just fussy but is almost needing to learn it all over again requires probably the most amount of patience I have ever required. Orla has been difficult to feed from the day she was born and 2 years down we are still not winning!! Add all this to the demands of caring for a child with considerable developmental needs. Anyhow, things have settled down somewhat since, Orla’s gut seems like it is finally starting to recover and there is an element of feeling like we are on the home stretch as far as the bone marrow transplant is concerned. Orla had some blood tests taken a couple of weeks ago as she had reached the milestone of 6 months following her transplant. The tests measured her immune function which our doctor informed us are remarkably good at this point. This is obviously great news and Orla’s reward is that she gets to start her immunisations all over again!! The particular day we went to start the immunisations, Orla had a slight temperature so we had to return a few days later. Orla appeared to have a new found fondness for visiting RCH that particular week as we went there 4 times, twice because she pulled out her nasogastric tube. I’m yet to conclude if it was coincidental or not that Dad was on duty both of these occasions….Mum however was on duty both times when it was reinserted, the first in record time and the second took 4 attempts, not pleasant for anyone involved, fortunately Orla forgets quickly. At one of these visits, we learnt and we very saddened to hear that another of the children who overlapped considerably with Orla in the BMT unit passed away. As a result of Orla’s BMT tracking well and immune system developing, she is now starting to slowly wean off the immunosupression medication, Cyclosporin, and a few of her other medications have also stopped now too. The other bonus is that Orla gets to lift her isolation status slightly. However the priveliges her BMT consultant suggested are those which we have already allowed ourselves!! Day + 160 Turning Two with a Temperature….. Unfortunately, Orla developed a temperature last evening and we had to take her to the emergency department at the royal children’s hospital. Ed has had a nasty cold/flu and unfortunately Orla has picked it up. We were allowed to bring her home last evening after her bloods were checked and a couple of IV antibiotics infused. We then had to go back to the hospital late this afternoon for her to have another IV antibiotic and be reviewed by the BMT doctors. She has had somewhat of a bad run over the past couple of weeks as her ear infection turned out to be fungal.This is now clearing with appropriate drops. She has started to eat a small amount in the past couple of weeks which is great and enjoyed some puree roast chicken tonight with us. Grandpa George and Nan are here and we have had a lovely evening despite the challenges of the day. We thank everyone for their kind birthday wishes, cards and gifts…She is very unlucky in many ways but extremely lucky to be so cared for and spoilt too!! Day + 150 In the news! Yesterday a story about Orla and fertility preservation appeared in all the News Ltd papers across Australia. Below is a couple of different links featuring the 2 different photos. Orla was very cooperative when the photos were taken here on Friday. It was quite a tricky story for the journalist but she did a great job. Day +148 Ears, tubes, tests and therapy! It has been just over a month since I last posted and shared the fabulous news of Orla’s bone marrow aspirate result showing 100% engraftment. A friend who lives in Switzerland emailed last week with his news and commented, “there haven’t been any blogs in a while?” It is lovely that people look out for them. My initial thought was, I don’t really have much to say. Whilst we have been busy, it’s doing much the same each day/ week. On reflection, there really has been a bit happening to write about but can generally be summarised with the 4 words in the title of this post. Orla has been attending the hospital each fortnight for blood tests and a review with the haematologist. She continues to do well from a BMT perspective, is gaining a small amount of weight and growing but continues to receivie all her nutrition via the nasogastric feeds. As of Thursday this week, through consultation with the dietician, it was decided to trial more bolus style feeds whereby she is given a bolus amount of feed every 4 hours through the day and then the feeds are turned off overnight. Currently each bolus lasts for approximately 3 hours but over time, we hope to increase the rate if she tolerates it. She still has quite nasty diarrhoea, which has been tested and shown not to be harbouring any bugs or viruses…We are told the gut takes the longest to recover after a BMT and with time it will. It is somewhat draining though and must be uncomfortable for Orla. Tubes, Orla pulled out her nasogastric tube as she went off to sleep the Wednesday night before last. A trip to hospital was required for a new one to be inserted the next morning, which was meant to be our week off hospital visits. This was trouble-free albeit a pretty uncomfortable procedure. The reason however that Orla pulled her tube out was because she was pulling at her right ear which bled through the night and again the next night, so back to RCH on the Friday to find she had infections in both ears. The ENT registrar suctioned the “gunk” from Orla’s ears which wasn’t much fun, the noise terrifying her. I was also suffering from a cold amongst this, really no big deal, however with Orla’s immune system still less mature than that of a newborn it was quite stressful in an effort to try to make sure she didn’t catch it, we seem to have been lucky. It was a simple head cold however it rendered me shattered, my resilience somewhat lower than normal, I think mainly due to fatigue. Orla had yet another hearing test a few weeks ago too. This time, with her aids on, to measure her brain activity in response to low volume sounds across all frequencies. The good news is that Orla can hear all sounds with her aids on. The audiologists will continue to test her hearing to try to get the most precise prescription for her aids possible. In a child Orla’s age, only small amounts of testing can be performed at each appointment as their tolerance is low. The haematologist is also referring Orla to a opthamologist to have her eyes checked. Yet another specialist to cover all the areas affected by Mannosidosis….! 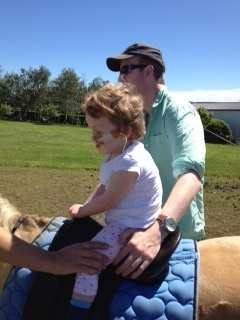 Therapy, Orla continues to have physio every week and is making good progress physically. Our wonderful physio, Belinda recommended another incredibly patient lady who specialises in early childhood development for the early years who is also visiting Orla weekly now. 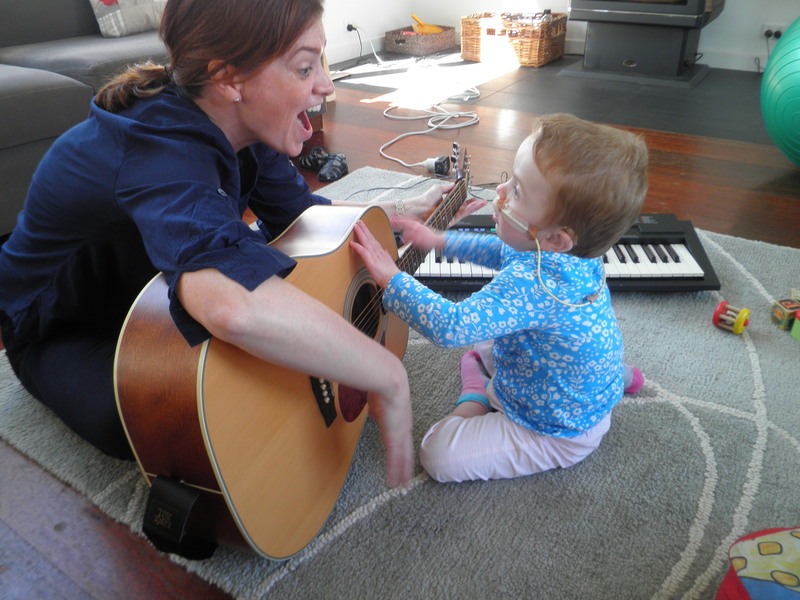 In addition, Orla is also eligible for government funded early intervention as she has more than one area of developmental delay. We have chosen an organisation called Villa Maria. She is assigned a key worker from one of numerous disciplines. Orla’s is a very experienced speech therapist who has engaged her extremely well already. 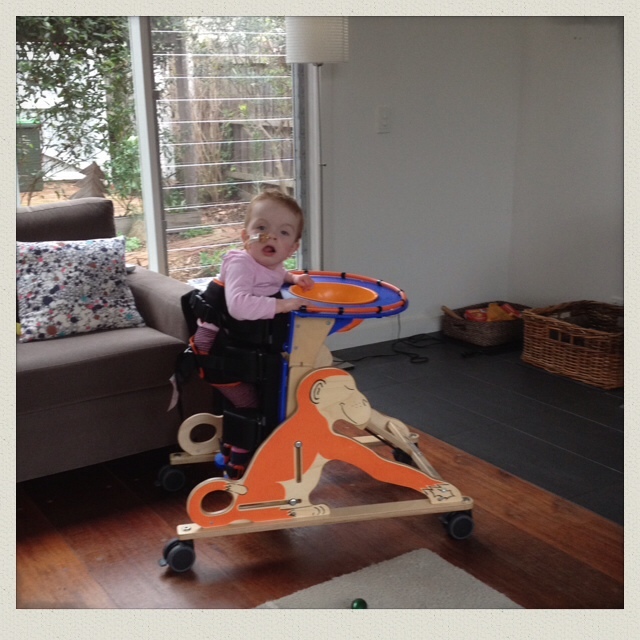 We have been to see Orla’s general paedatrician which was a challenge for a few reasons. Firstly, Orla woke from a nap covered in poo to the point she needed to be bathed before the appointment so I was stressed to make it there on time. Once we arrived, Orla was very anxious and didn’t even allow the doctor to examine her without screaming so we didn’t bother. The paed and I also had a fairly confronting discussion around Orla’s future. Our paed has been a great support to us through Orla’s diagnosis, the decision of to do the BMT or not and then through the BMT itself. We discussed the fact that although the transplant has been a great success, the reality is that Orla was born with a neurodegenerative disease. It is hoped that the transplant will halt this degeneration but we don’t know and there is no way of knowing how much and what damage is irreparable. 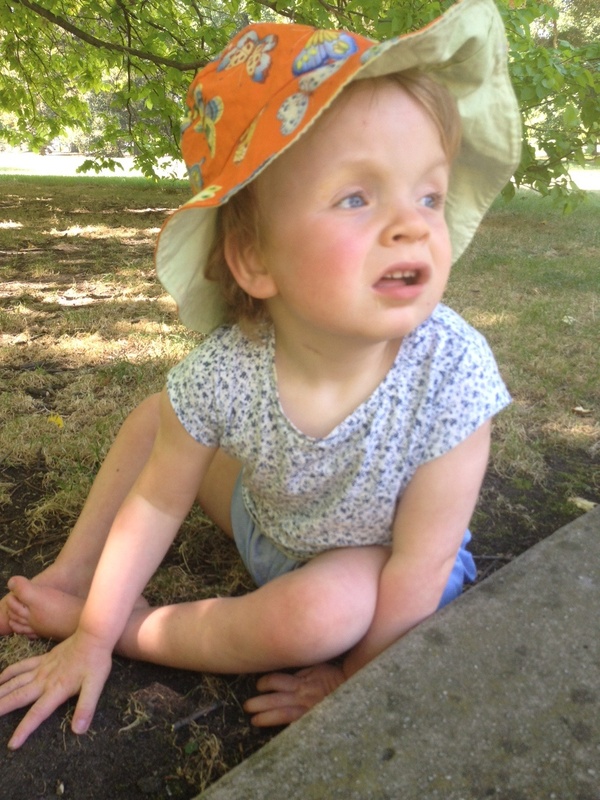 And yes, she feels Orla will be left with a disability but how great this will be is unknown and whilst we hope and pray it to be mild, there is no way of knowing. Preparing for this unknown is hard. Everyone has their uncertainties in life this is ours..
Day + 118 Can’t get any better than that….! Orla was seen at the hospital today and we received the results of her bone marrow aspirate from last week. 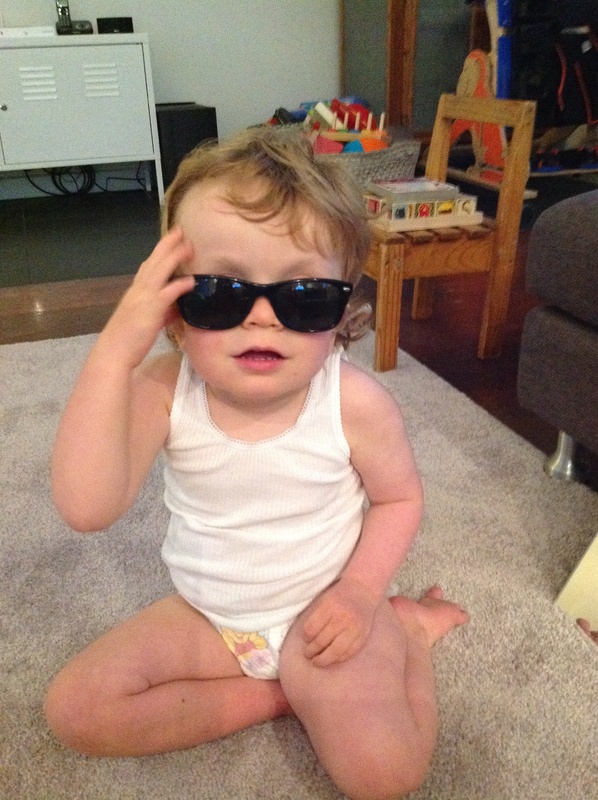 Orla’s bone marrow is 100% male and therefore 100% donor…! So as you can imagine, we are delighted, the hard yards feel very worth it when we receive such amazing news as this. We simply could not have hoped for anything better than 100% engraftment. The previous chimerism results looked at Orla’s blood where as this looked at her bone marrow and, as the doctor hoped, gave us a better result but more precise result too!! Orla has also put on some weight since last week too. Her weight has now returned to that which it was when she was discharged from the BMT unit. The dietician and speech therapist reviewed Orla today regarding her feeds and where she is at with eating. We hope she will continue to gain a little more weight in the next few weeks using a mix including some high calorie feed and then it is hoped soon she will be able to have some time off the feeds and transition to bolus rather than continuous feeds and she might get hungry in between!!! 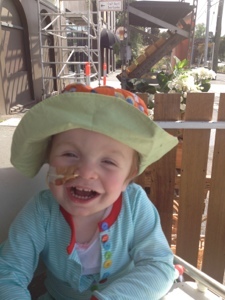 Orla doesn’t need to go back to RCH for a whole 2 weeks now….! !